Last December, I had an early Christmas present. I found out that my hats would be featured at the Milliner’s Corner at the lovely and historic Keeneland Race Track! 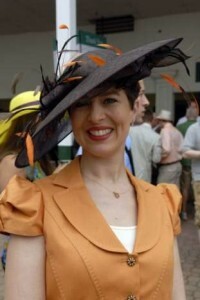 My mind then started racing, turning over ideas for my Keeneland Collection, which consists of 45 hats and fascinators. Many are one of a kind designs and are only available at Keeneland. I will be at Keeneland on April 14, 15, 21 and 22nd to help you pick out your own Polly Singer creation . Please stop by and say hello! 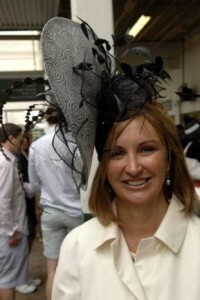 I am happy to help you pick out the perfect hat or fascinator for the Kentucky Derby! Fashion Trends and 2016 Kentucky Derby Hats, continued! Why do women like to be Southern Belles? I think it is the time to be feminine, have fun and turn those male heads! Enter the Kentucky Derby! As a girl born in Kentucky, I can totally understand the Southern Belle mentality. While living in New York City for over 13 years, I was endlessly pursued by men wanting to hear my Southern accent. I have lived in Kentucky for 18 years and am only now getting my Southern accent back. For the 2016 Kentucky Derby, we pulled together the latest fashion trends, suggestions and combinations, and combined them with beautiful Derby hats. 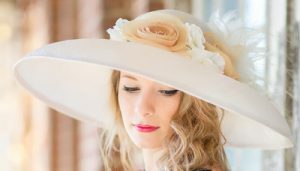 Picking out a classic dress is the first step on your Kentucky Derby fashion journey, and choosing your Derby hat is a close second. I think Simply Demure would be perfect with this dress. The flow of this dress lends itself to a relaxed, feminine hat. Wearing a longer dress to the Derby is definitely different. I would personally do something like this. Derby is a very long day. At the end of the day, I could hardly walk. I am drooling over these sandals as I remember women taking off their high heels to walk out of Churchill. I love the idea of a black and white dress. It is classic and gives a hat designer so much to work with! The black and white hat with a vivid pop of hot pink is classic Polly Singer! So much so, that I designed my hat boxes in the same colors. Better hide the credit card because I would purchase this dress in a heartbeat. For an elegant vision, I would pair Kathrina with this dress. Perfect for the Kentucky Oaks, it is simple and elegant. Classic Chanel and smooth. I love fashion simplicity because it allows the client to really look amazing. Hats that are over the top take away from the client’s own beauty in my opinion. You will notice that celebrities always tone their outfits, not over do. This one of my classic hats. Mischa would look amazing with this dress. The structure and angles of the hat complement the geometric design of the dress. As a young designer, I was often baffled working with patterns like those on this dress. A simple, classic hat design is the best remedy. I hope these ideas have helped, and given you some idea of how to match a hat with this year’s fashion trends, especially as we near one of my favorite events, and I will bet you can guess what that is. Any questions, please contact me and we will help you pick out your special hat, or create a gorgeous custom hat exclusively for you. But hurry! The Derby is just around the corner! 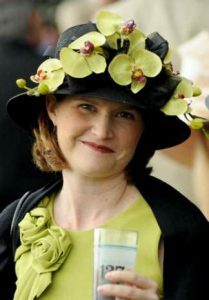 Contact us now to design a beautiful Kentucky Derby Hat for you. Busy here on new hats! This is always the time of year that I love, designing for the spring. The hardest thing for me is not coming with new ideas, but having to edit my designs. And of course, I love working with new colors. I thought this chart was interesting in that it highlights the various feelings that color invokes. I love working with color. Anyone who has visited my house will tell that it is filled with color. Each room has a distinct color, whether it is a warm creamy yellow, warm terra cotta to soft ameythst upstairs. I always enjoy the psychology of color too. My design room went to from a blue/gray to Sherwin Williams Youthful Coral. I have so much more energy now. Color is so important with our feelings. Can’t wait to finish the new hats! Each season, Pantone releases colors that will appear in clothing designs and accessories. The colors shown above are for Spring 2015. My personal favorites are the Glacier Gray and Tangerine. We have seen the classic blue for awhile. How does this all relate to picking your hat? A safe general bet is to choose a neutral base color and then add the pops of color. 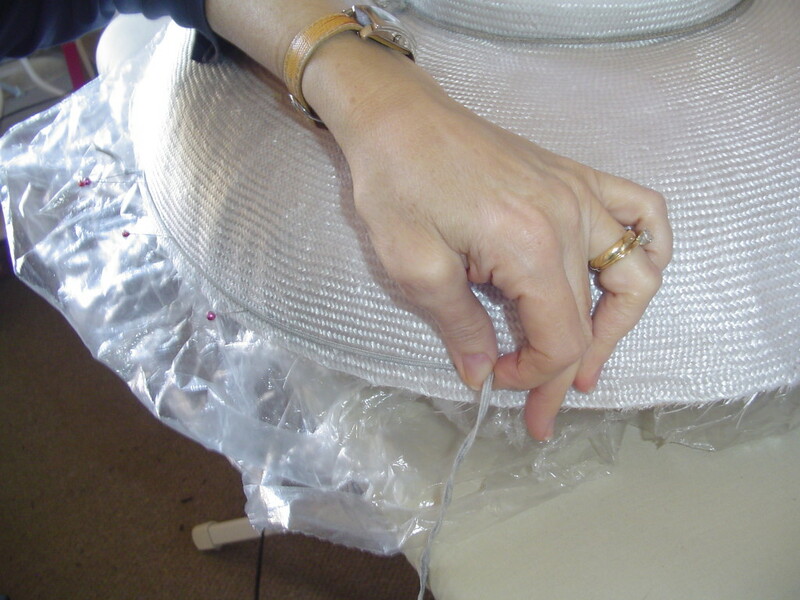 As many of you know, everything is sewn on by hand, so hats can be retrimmed later on. Below are some hats that would work well with the Spring 2015 color palette. I designed and donated three ladies hats to the Kentucky Equine Humane Center. This worthy organization captured my heart last year when I went to visit. Being a long time champion of animal welfare, I was taken by these lovely horses and the mission the of the KYEHC to rescue, rehabilitate and adopt out these horses who had not had the best of lives thus far. These three hats are available on ebay. The bidding ends at 6:00 p.m. on Sunday, April 6th. Any of these hats would be great for Easter, the races, an event or even the Oaks or Derby. We have had the very good fortune to have been selected to participate in the $25,000 FedEx Small Business Grant Challenge. It is exciting and an honor. As a designer and producer of high end ladies hats, we would love the get grant for many reasons. As you know, we are a small business based in Georgetown, Kentucky. For the past 20 years, I have made and sold hats for ladies all over the world. Everything is hand made in our studio from start to finish. 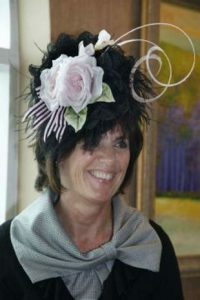 We custom make ladies hats for weddings, the races, gala events, bridal showers and luncheons. The humble beginnings of Cafe Macchiato. The hat being blocked on specially made hat blocks from England. The finished hat, Cafe Macchiato. Some of the grant monies that we receive will go towards a project very near and dear to us. The Kentucky Equine Humane Center is a rescue group that rescues, rehabilitates and adopts out horses. Our Hats, Horses and Hope line is based on the group’s horses. A percentage of the sales from those hats goes towards the horses at KYEHC. Remember, you can vote daily for Polly Singer Couture Hats and Veils until February 23, 2014. We so appreciate everyone’s support! Thank you! 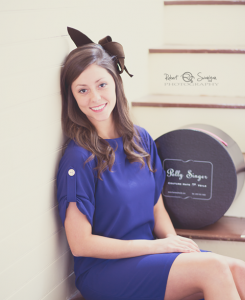 At Polly Singer hats, we are selling our custom hat boxes. These make excellent gifts as well as gift boxes. It can be a lot of fun to fill a hat box with teas, candles, vintage items and hats as well! Here are the hat boxes that we currently have in stock. The boxes are made from heavy cardboard and are very sturdy. Please email us at polly@pollysinger.com or call 859-533-1426 to order. 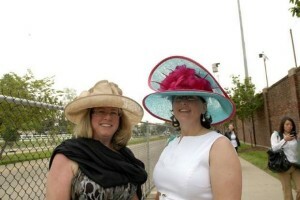 I always love looking at hat photos after the Kentucky Derby and observing trends. This year’s Kentucky Derby fashions were the best yet in my opinion. There was a wide range of looks from tiny fascinators to massive hats. 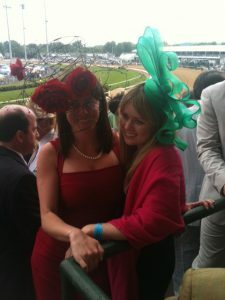 In my previous blog, I showed some of my clients at the Derby. However these photos are crowd shots of hats that I found interesting. The wired hat on the left is fabulous. The green bow hat is what Princess Beatrice's hat should have been like. This fascinator is just amazing. Love the feathers and the way they are angled. The hat on the right is unusual. The burgundy edging really sets the design off nicely. Such a pretty picture. Hat, hair and make-up all look fresh and well put together. This ensemble is superb. Simple,yet it speaks volumes. This gorgeous creamy hat works well with this dress. The shimmery effect is nice. 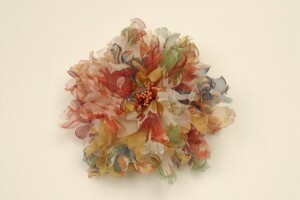 A fun fascinator that looks right out of Ascot. Love the retro look of this hat and the way the tiny bits of orange feathers highlight the dress. The quintessential Kentucky Derby hat, which looks absolutely gorgeous on this lady. A winning look. A very unusual fascinator. The sinamay fabric is wonderful. A very British look. About a month ago, Lexington Herald Leader writer Vicky Broadus stopped by for tea and a chat. Click the Headline above to see what Vicky had to say about her visit. All photography courtesy of Vicky Broadus and the Lexington Herald Leader.